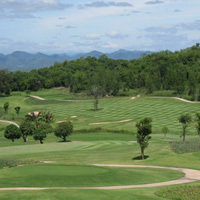 Banyan Golf Club has won several awards such as best club house Asia Pacific and Best Golf Course in Thailand. Lush Zyosia fairways, a local grass rarely seen on golf courses in Thailand, are a pleasure to hit from as balls sit up nice throughout the fairways and roughs. Dark green Paspalum tee boxes add to the stark color contrast on the course and are a nice decorative feature. Greens, constructed of the same Tiffeagle grass as used at other Thailand premier courses like Thai Country Club and Alpine Golf Clubs in Bangkok, makes for fast but receptive putting surfaces. The signature 15th hole is a 139 yard par 3 with panoramic ocean views all the way to Sing Toh (Tiger) Island in the Gulf of Thailand. Hole 12, a par 5 monster is 610 yards, all uphill, making it impossible to reach for even the most accomplished of golfers.